writing-course : Write a Book in 3 Easy Steps. 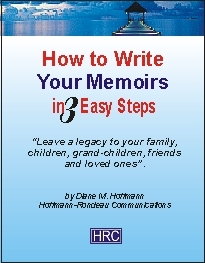 The "How to Write Your Memoirs in 3 Easy Steps"
Are you thinking of leaving a legacy for your children or grandchildren? I'm so glad that you've come to this page and that you've been wanting to write a book. I'm ready and eager to show you how to do it in 3 easy steps. From here you'll be on your way to become the writer you always wanted to be. Well, after having written several hard copy books, e-books and hundreds of articles on business, personal improvements, health/nutrition and theology, you will agree that I have some good material to share with you. First, I'll show you how to lay out your ground work, using examples, and what to think about as you prepare your ideas. Then, I'll tell you some of the key things you need to think about and give you tips and guidelines all along the way as you develop your book or story. In this powerful-pages ebook, I'll tell you what to remember to do as you write, and steer you to some suggestions to consider as you develop your own style of writing. All you have to do is follow the easy guidelines and before you know it, you'll have your first book written -- and you can start your next one! I'm really glad you're interested in writing, because I love writing. There was a time, many years ago, when I did not know how to write. Then I took a course in creative writing and basic journalism. And I've been writing ever since -- as you can see from this web site and others. Writing to me is like oil painting. Every word is a brush stroke that contributes to the final result. Of course I don't get into the grammatical, syntax and creative construction of sentences in this course -- I just get you started in putting the product together. Just write what's on your mind. The rest comes from the editing as you will see. You never know where it'll take you. Great fun. Great hobby. Great opportunity to open up your life to something new and exiting! How to organize your work. How to know your audience. Sub-divide your sections if needed. Continue and bridge-over your sections. Finish with full circle to present events or appropriate ending. Edit until you are totally satisfied of it. I'm making it available to you right now at an incredible recession busting price of only $19.74! YES YOU READ THAT RIGHT: ONLY $19.74 to get you finally to write your own book. And, listen, I know you will be totally happy with this e-book, because I really put my care into giving you what I would have wanted myself when I started out years ago. But, if for any reason this e-book is not what you were expecting, just let me know and I will arrange for a refund from PayPal.